These ceiling fans use less energy than a 100 watt light bulb. With increasing fuel costs, the ceiling fan systems makes sound operating sense. Agrifans are easy to install on ceiling beams or cross braces. Agrifan Manufactured for Ramm commercial grade ceiling fans are a tough fan for tough conditions. These fans are built for agriculture and has been proven in the industry to stand up to the tough conditions of equine and other wet, dusty or extreme heat areas. They have been manufactured for over 25 years with the same design. 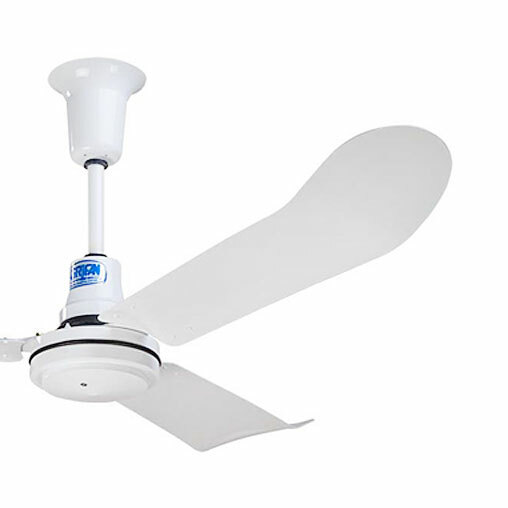 These fans circulate the air and do it more efficiently than other agricultural ceiling fans. The energy efficient motor runs on less energy than a 100 watt light bulb. When used with an existing cooling or heating system, the ceiling fans increase efficiency of that system up to 30%. In less than one year the commercial grade ceiling fan system can pay for itself in energy savings. They have been tested by farmers for over 25 years and has proven its strength and reliability. These fans come with a full three year manufacturer warranty and can stand up to heat, humidity and condensation. Composition: Heavy-duty, all metal - no plastic. Blades are aluminum for both strength and efficiency. - Bill From NC," I still can't get over the air movement from these fans and how little it affects my electric bill." - CECE FROM SC SAYS," I LOVE MY FANS. THEY WERE EASY FOR MY ELECTRICIAN TO INSTALL AND THEY REALLY MOVE AROUND THE STAGNANT AIR WE TEND TO GET IN THE BARN." - Last Spring we replaced all of our Fans in our current barn with these and it was probably one of the best investments that we have made to our farm. Not only did it cut down on the electric bill but, they are much more effective then what we originally had installed. My husband (whom is not too quick to jump on farm purchases) also purchased these for his work barn Great product and investment. *Note: To reduce the risk of injury, please install the fan so that the blades area at least 10' above the floor. Technical specifications subject to change without notice.